Underlined Korean characters are confusing. Underlined Korean characters are confusing. Sometimes the characters are underlined, sometimes they are not. The underline looks like it’s part of the character, so it takes a little bit of mental gymnastics just subtract the underlined and learn the rest. It sounds trivial, but it is making it hard to learn. Would it be possible to remove the underlines, since they have absolutely no function anyway. Sorry to necro this thread but I have the exact same issue with Japanese and it was frustrating for me to read Kens message fully understanding what he's talking about and seeing that nobody understood. Underlining every character for no apparent reason. Please DuoLingo people, stop doing that. 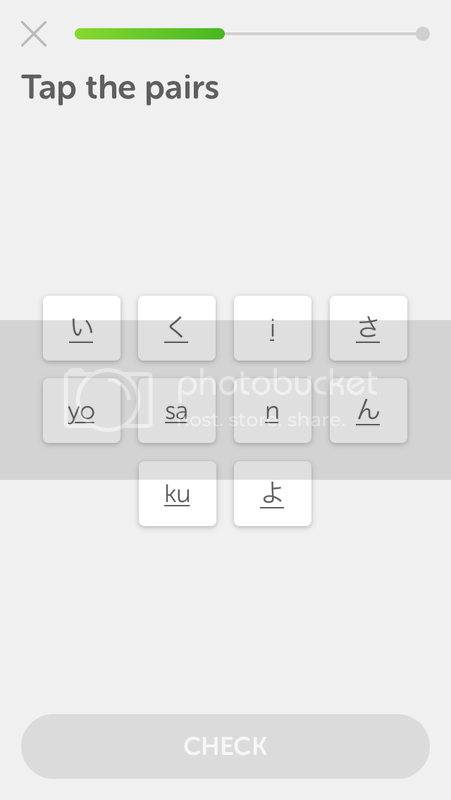 Oh, the web version of Japanese is available now and guess what? The sale on underlines didn't apply to the web version. 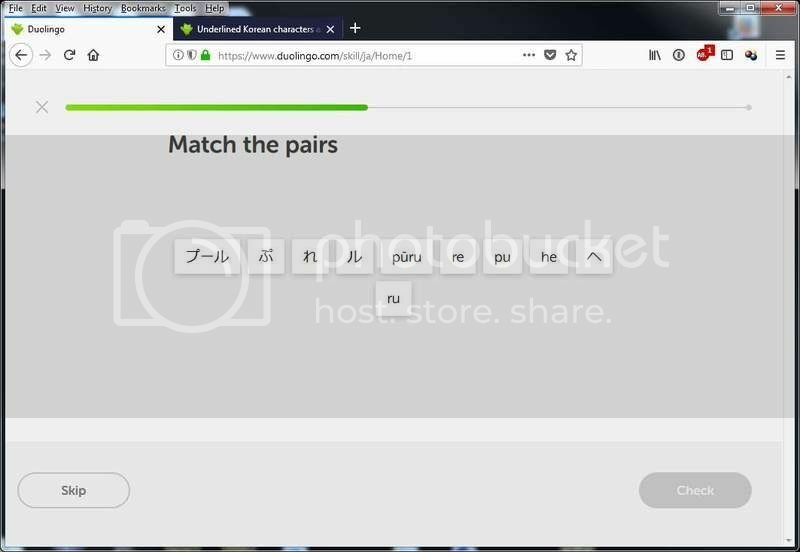 DuoLingo web guys, please talk to the phone app guys and show them how it's done. Thanks! Oh.... that's what Ken was talking about... I don't know what went wrong, maybe you can file a bug report in the troubleshooting thread? I'm sorry, what exactly do you mean by "underlined"? Do you mean letters in the batchim position, for example, the ㅇ in 빵? By "underlined" I mean "having a horizontal line beneath it." In other words, 빵 is not underlined. If it had a horizontal line (an underline) under the whole thing, it would be underlined. An example of underlined text is a hyperlink on a web page. The problem is that the horizontal line could be a Korean letter. Go to the first Korean lesson. It teaches a series of characters (by which I mean "combination of letters"). Then it displays a screen containing buttons where you are supposed to match each character with its transliteration. Tap two: if they correspond, they turn green. If they don't, they turn red. On this screen, everything is gratuitously underlined. Korean uses a horizontal line as a vowel, so the underline makes it look like the character has an additional letter. There is absolutely no need for the underlining and it serves absolutely no purpose other than confusing people. The Latin, Greek, and Cyrillic alphabets do not use a horizontal line as a letter, so the underlining is just as pointless but not confusing. In the Korean alphabet, however, a horizontal line is a vowel, so it looks the character has an additional letter. This is extremely irritating to a beginner who must mentally subtract the underline to recognize the character. hold on a minute, there actually is a purpose in the letter ㅡ, in syllables like "으", "그", etc. it functions as a vowel, making an "eu" sound. As for the matching puzzles in the app, there is no underline, so I don't know what you're talking about. As for comparing the Korean alphabet to Latin and Cyrillic scripts, Korean is a language isolate, descending from no other languages. In fact, the Korean alphabet is actually quite logical, with the characters being based off of physical positions of the mouth/throat. Comparing Korean with other alphabets just makes no sense, it's like saying that apples make no sense as other fruits don't have edible skin. (well, besides grapes) Sorry if I come across as rude, just want to help. Huh, really? I just tried the Alphabet 1 skill, and saw no second ㅡ.
I give up. I'll put up with it. None of you have a clue and none you have “tap the pairs” exercises. Thank you for sharing your erudition on irrelevant topics. I have the same problem. I believe it depends on the device you’re using. Try a PC or laptop. On my previous phone, an android, there was no underlining of Korean characters. I « upgraded » to an iphone, and the characters are tiny underlined specks on a mostly blank page. Come on people, there’s plenty of room on the page! And underlining makes the characters extremely difficult to read ! I basically gave up at that point. Now I’m in Korea and giving it another try. Had to reset my progress to zero. The problem is still there. THIS NEEDS TO BE FIXED!!!!! People are trying to help you and trying to understand your question, yet you are being incredibly rude. Perhaps providing a screenshot would help with your issue, that is if you actually want help. Exactly! As for not having "tap the pairs" exercises, the mobile app is LITERALLY filled with tap the pairs exercises, unlike the web version. And if I remember correctly, the Korean course is currently only available on the app. Why you are learning Korean ?? Feedback: The Korean Romanization is confusing and misleading. Are there any serious learners anymore? "The clouds are really beautiful!"